CAMARILLO, Calif., Feb. 8, 2018 – Semtech Corporation (Nasdaq: SMTC), a leading supplier of high performance analog and mixed-signal semiconductors and advanced algorithms, announced that Lineable, a Seoul-based startup manufacturer of GPS trackers, has integrated LoRa® devices and wireless radio frequency technology (LoRa Technology) in its new wearable safety device, Silver. 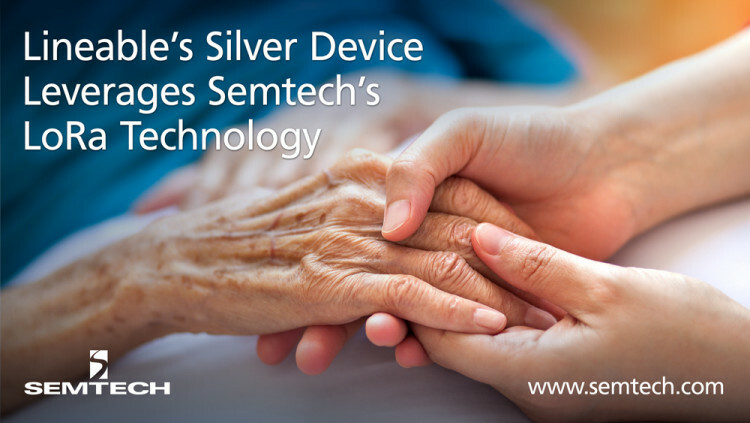 Lineable’s Silver device, co-developed by the National Police Agency of Korea, SK Telecom and SK Hynix, is specifically designed for patients with Alzheimer’s. Through a hybrid GPS system, caregivers are notified when patients leave the house or out of the designated safe zone. Many patients are not constantly monitored by a supervisor, and in Korea, about 10,000 Alzheimer patients go missing each year. Silver is currently being used by the police in Korea and the police plan to distribute 3,000 devices each year to Alzheimer patients, free of charge. During its first month of service in October 2017, the Silver device helped save six patients and in three months, it helped save 20 more patients. Lineable, headquartered in Seoul, Korea, is a hardware-based startup that is creating smart solutions to help families protect and prevent potential problems. By using a combination of the most common and most advanced technologies such as Bluetooth, GPS and LPWAN, Lineable delivers the most effective and price competitive gadgets to the market. For more information, visit www.lineable.net/. All statements contained herein that are not statements of historical fact, including statements that use the words “designed for,” “plan to,” “designed to,” “expected to,” or other similar words or expressions, that describe Semtech Corporation’s or its management’s future plans, objectives or goals are “forward-looking statements” and are made pursuant to the Safe-Harbor provisions of the Private Securities Litigation Reform Act of 1995, as amended. Such forward-looking statements involve known and unknown risks, uncertainties and other factors that could cause the actual results of Semtech Corporation to be materially different from the historical results and/or from any future results or outcomes expressed or implied by such forward-looking statements. Such factors are further addressed in Semtech Corporation’s annual and quarterly reports, and in other documents or reports, filed with the Securities and Exchange Commission (www.sec.gov) including, without limitation, information under the captions “Management’s Discussion and Analysis of Financial Condition and Results of Operations” and “Risk Factors.” Semtech Corporation assumes no obligation to update any forward-looking statements in order to reflect events or circumstances that may arise after the date of this release, except as required by law.